A collection of papers, speeches and radio broadcasts by an eminent African leader, this book comprises writings on statistics, ethnic issues, education, governance, and other concerns central to contemporary life in Ghana. 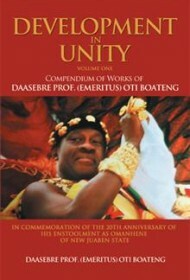 The first in a series, the book’s title, Development in Unity, echoes the mission of the Akwantukese Festival, celebrated in the author’s home, New Juaben, where he is the traditional ruler (Omanhene). Since Daasebre, as he is known, has many distinctions—former UN Commissioner with a Ph.D in statistics from the University of Liverpool—his views are significant to his countrymen. Some selections here are speeches given on state occasions, such as the opening of the Computer Centre at the University of Ghana and the launching of a report on Ghana Living Standards. Daasebre spearheaded the Ghana Statistical Service Report on Child Labour, in 1994, containing moving and observant descriptions of street children: “They serve mainly as cleaners, waste disposal workers, shoe shine boys, porters, iced water sellers and sellers of other goods like sweets, razor blades, dog chains and newspapers.” Daasebre authored Barack Obama—Africa’s Gift to the World, to commemorate the American president’s visit to his country. A highlight of this assortment is the wide scope of Daasebre’s career; he garnered many national awards and received a key to The City of Rochester, New York, for his promotion of a twin/sister city relationship between Rochester and New Juaben. The American Biographical Institute and the International Biographical Centre (UK) recognize his contribution to the study of statistics. This is more a reference work than a narrative; the author’s communications are for the most part scholarly, demonstrating attention to factual and numerical data that can make for dense reading. Yet Daasebre occasionally reaches beyond numbers, revealing personal regard for his fellow Ghanaians and high ideals for the nation. Although the readership for this collection will be limited, it is a noteworthy contribution to the annals of progress in Daasebre’s native land.